In 2 Corinthians 8:6-15 Paul told the Corinthian church that he wanted them to learn the virtue of generosity and grace. The context of this was the contribution that Paul was taking up from the Greek churches to take back to Jerusalem. Chapter 8 begins with Paul’s description of the Macedonian churches as churches that allowed their poverty to be a source of generosity. Paul is exhorting the Corinthian christians to excel in the grace of generosity as well. The sermon today goes deeply into the question of whether you are a generous person. Monday July 30. Read 2 Corinthians 8:1-4. 1) The churches of Macedonia which would have included Philippi, Thessalonica, Berea, and Athens. What does Paul say about the economic condition of these churches? 2) What excuses did these churches make to explain their NOT giving? (This is a trick question.) 3) What do you think Western churches could learn today from the Macedonians? Tuesday, July 31. Read Romans 15:25-29. 1) What did Paul tell the church at Rome about the Macedonians? 2) What was the target of their giving? 3) Why did Paul say generosity is a no-brainer for Christians? Wednesday August 1. Read Amos 6:4-6. 1) Amos was an Old Testament prophet. Why does Amos say “alas” or “woe” in this text? 2) Why do you think that money or wealth is such a stumbling block for people? 3) What does Amos say will happy to his stingy audience? Thursday, August 2. Read Philippians 2:5-8. 1) What does Paul say about Jesus’ generosity in this passage? 2) If Jesus was giving money instead of his life, what would that look like in practical terms? 3) What values did Jesus hold that would motivate him to be so unselfish? 4) What do you want to learn from him in this regard? Saturday, August 4. Read 2 Corinthians 8:6-5. This is Sunday’s sermon text. How can being generous grow our spirits? In our culture of “zero sum gain,” where the bottom line is the bottom line, the story above sounds like foolishness. After all, who hasn’t heard the adage, “Give a man a fish and he’ll be hungry tomorrow; teach him to fish and he’ll never grow hungry” While pragmatic advice, it simply is not the gospel. Jesus said it this way, building on the Old Testament plea to be generous. “Give to those who ask, and don’t turn away from those who want to borrow” (Matthew 5:42). “Be generous and lend them [the poor] whatever they need” (Deuteronomy 15:8). When Jesus (and Moses) uttered these words they were likely shocking. After all, the economic culture of first-century Palestine was made up of, primarily, working class peasants with very little expendable income. So, when Jesus said, “Give to those who ask,” they wouldn’t have been thinking, “Will this affect my 401-k?” but rather about the next meal on the table. Nonetheless, Jesus’ call—then and now—was to be generous, regardless of how the recipient might use the gift or how much we might have in the bank. And the reason for such counter-cultural, strange advice? The gracious generosity of God, seen most beautifully in the Incarnation! It is simply amazing to think that God gave the greatest gift of all, his very nature, with the possibility of eternal life forever, and many—far too many—would refuse or squander it. And yet, such is the nature of radical-no-strings-attached generosity! That’s not to say God wants his generosity to be spurned or not appreciated. 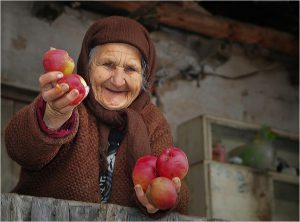 And of course, when we seek to be generous, we desire in our heart of hearts that nothing be wasted. The real bottom line, however, is we are to be generous, not expecting anything in return, simply because it’s part of what it means to be a child of God. As we seek to put on this virtue of generosity, not expecting any immediate reward or even to be thanked, we give the Spirit space to conform us into Christ’s generous identity, to the glory and praise of Father-God. So, how can we foster a more generous way of life? Like the other disciplines, it takes practice—that is, a willingness to start where we are with hopes that, through time, grace, and experience, generosity will become a way of life. Here are a few practical suggestions that you might try on for size. Start a missions envelope, putting in, for example, 10% of any unexpected income (i.e., bonuses, tax refund, birthday gift, etc.). Then, every six months (and/or when opportunities arise for spontaneous giving) make an anonymous gift to the missionary of your choice. Make a list of your blessings, thanking God for the experiences, people, and things that are tangible reminders of God’s generosity in your life. The idea here is, as we remember how generous God has been with us, we can’t help but look for ways to show our generosity to others! It could be said that generosity gives birth to simplicity and simplicity makes generosity possible. One practice that can foster both is this: when you receive a new shirt, or dress, or book, give one away. Not only can this be a blessing to others but it can be a tangible, though perhaps small, step of not accumulating more. Invite someone to lunch, coffee, or over to your home for a light snack. It doesn’t have to be extravagant or expensive. Remember, it’s the [generous] thought that counts!